2013 was another year of contradictions for Pakistan. On May 11, 2013 the General Elections were held successfully. Despite fears of violence, low voter turnout, and lack of transport, millions of people –including women — came to the polls across the country. This report highlights the impact of the prevailing security environment on Pakistani women, especially in conflict-stricken areas. It also reflects the positive strides women are making for participation and voice in the country. 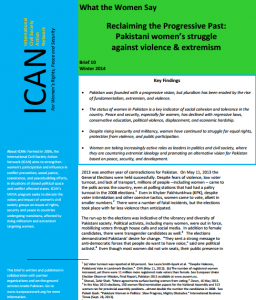 Drawing on the expertise and insight of practitioners in women’s rights, peace and security, ICAN puts current trends into context and offers recommendations for action by national and international actors to alleviate the conditions that foster extremism.